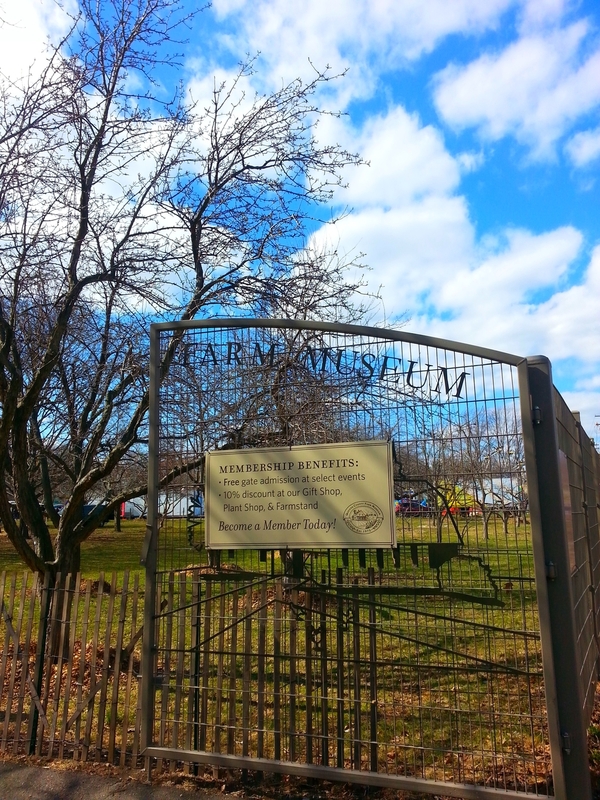 Queens County Farm Museum is a 47 acre farm located in Floral Park, Queens. First farmed in 1697, when much of the surrounding area was farmland, QCFM went through a series of ownership before being named a New York City Landmark in 1975. They are protected from development by the New York City Department of Parks and in addition to providing historic tours, educational programming & community events they also support a 7-acre diversified farming operation that continues to grow. I had the great pleasure of discovering & exploring the farm this past Saturday, as part of Just Food's annual conference. A small group of participants were treated to the history, a tour, and some hands-on farming activities. We even got to enjoy a freshly picked tossed salad along with our generously donated Chipotle burritos at lunch. Across five growing fields, the largest of which comes close to 1 acre, 40 different vegetables with as many as 12 varieties per species are cultivated alongside an orchard, vineyard and perennial berry crops. Plants are currently being grown in greenhouses and cold frames, while the fields are prepped for the season. The Northeast has a very short growing window, which can be extended by starting seeds indoors and rooting young plants outside in the early spring. While not organic certified, they follow organic growing practices. The farm works on a 5 year crop-family rotation - meaning the same species isn't planted in the same place until the 6th year. This rotation mimics natural systems to manage nutrients and prevent pests without using nutrient additives or pesticides. Sheep, goats, cows, chickens, alpacas, bees and pigs also live on the farm. 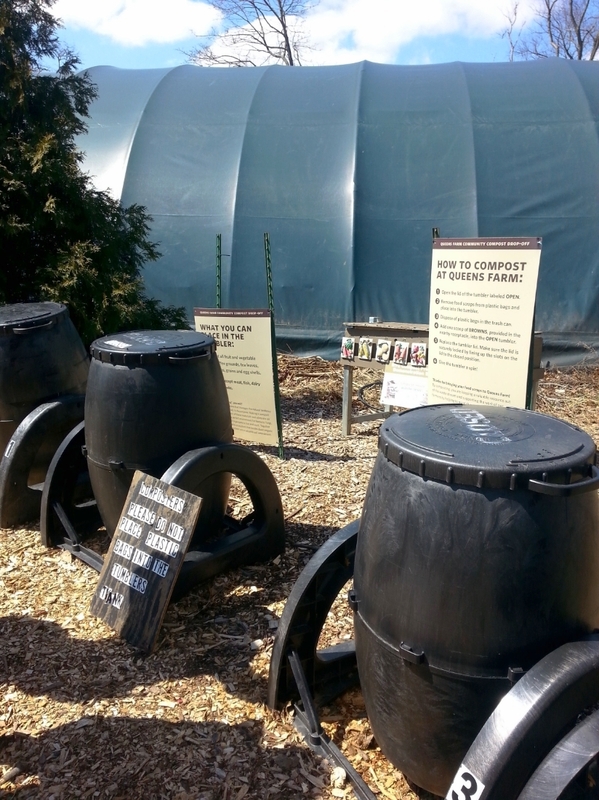 The animals support education programs, produce wool, eggs & honey and provide manure for compost. In the gift shop you can purchase the yarn spun from the wool along with fresh vegetables, herbs, honey, & eggs. Some items can also be purchased on Fridays at Union Square Greenmarket. In addition to learning all about QCFM from Leah & Ali, our group was treated to some special hands-on experience. First, we visited the hen house to collect eggs then brought them back to the farmhouse where we cleaned & packaged them for sale the following day. The freshly collected eggs were warm and varied in shape, size & color. Hens lay eggs about every 24-36 hours, so you'll generally collect a few less eggs on a given day than the number of hens in your coop. Next, we headed out to the fields to mulch the perennials. There are various perennials planted on the edges of the main vegetable fields, to create a distinct and attractive border. Mulch can be added to prevent weeds and improve water retention in the soil. With instruction from Kennon, the Director of Agriculture, we carefully placed mulch around the freshly weeded perennial beds. When you spend your days surrounded by concrete, pavement & brick you need to escape to sprawling acres of dirt. I highly recommend a visit to Queens County Farm Museum. Admission is free and you can follow a self-guided tour or elect to take a guided tour of the farmhouse or a hayride when in season. Be sure to check out the events calendar for additional programming!